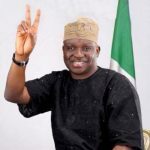 EKITI STATE GOVERNOR, AYODELE FAYOSE has stirred the honest net during his declaration for Nigeria’s Presidency in 2019 yesterday. And his follow-up interview on the alleged squander of bailout funds for Ekiti state further exposed so many revelations on the reasons Femi Falana, Nigeria’s attorney don’t like him, why Economic and Financial Crimes Commission (EFCC) official are conspiring to flagrantly disobey court orders from competent jurisdiction in Nigeria. In his historic declaration, Fayose declared that he is going straight to Aso Rock Villa as the next elected president of Nigeria. During his speech, he said he is the next president-in-waiting as destined by God. The governor states that he was hopeful that if supported by his party, the Peoples Democratic Party (PDP), he would take over government from the ruling All Progressives Congress (APC). He, however, said in a letter addressed to leaders of the PDP that his ambition to be president was without prejudice to the party’s position, but in the overall interest of the party and the country. The letter read; “It is with a deep sense of responsibility that I write to inform you of my intention to seek the ticket/mandate of our party to contest the 2019 presidential election. Fayose on Channels Television explains: “The man that spoke for the party was the man i did not support for the gubernatorial election of Ekiti State because i picked my deputy. So that is coming from a corrupt mind and a selfish individual. It is better to ignore Barrister Femi Falana. It is now that we realize that he is a member of EFCC. He is an official of EFCC speaking for them. He is equally from Ekiti State, because they all desire a professor to be there. He contested against me in 2003, he lost, he had been an hardened enemy. So, I leave him to his stories. Let me say again that those who would wait for me, will wait in vain. I need to remind them again that he and others conspired against me in 2006, to God be the glory, I am seated here as Governor of Ekiti state. “You are talking about immunity. May I say to you expressly, I speak for the common people, I have nothing to be afraid. I will continue to speak for the people. I don’t care whatsoever you have against me, wait for your time. Don’t be in a hurry. Don’t hurry your life. Allow time to take its course. For eight years I was in EFCC, you took me to court, I defeated you. God gave me victory over you and whatever you are putting together, the Lord will give me victory over you. I cannot be bothered about that. “To the question on bailout funds in Ekiti state, I want to say expressly that there is a court order against EFCC that says ‘No official of Ekiti state must be invited by EFCC.’ This matter, EFCC wrote a petition against the court, which order was granted. They wrote that the file be transferred to CJP, to be sent to Akure. It was sent to Akure and thrown out. EFCC officials are busy acting against the Rule of Law. For us to fight corruption, allegation is not enough. Stories not enough. To properly fight corruption, allow due process to prevail. Regarding the apprehension of Ekiti state Accountant-General and Commissioner of Finance, he said: “Arresting my Accountant-General and Commissioner of Finance today is shameful. Why did it coincide with my Presidential declaration today? You are intolerant of opposition, I cannot be perturbed by that at all. You should appreciate that there are states, even my predecessor has alleged that documents filed into EFCC, nobody has called in for one day. I cannot be bothered by your strategies, I cannot be bothered by your conspiracy, it is a matter of time. May I say to you expressly, if your strategy as you just said that anybody that is fingered in corruption is corrupt, that is wrong. The fact that you finger someone in corruption does not mean the person is corrupt. “That automatically amounts that the bailouts even if used alone for salaries cannot pay both state and local governments’s salaries for one month. May I say to you again, I don’t appropriate money in Ekiti state. Rather, I give the receipt of our allocations to the labor leaders. I have the standing committee of labor leaders, they share money in Ekiti state. So, you are all chasing shadows. The labor leaders came out an said to them ‘Our governor did not divert the bailout funds. Our governor gave out the bailout funds to appropriate. Coming on television to announce that you have arrested some people because I have declared my presidential election ambition is a waste of time. We are owing FOUR months salaries in Ekiti state.